Fork Fest is an annual event organized by Local First. It is a celebration of all the wonderful food and drink created right here in Grand Rapids. We are very pleased to announce that Connie’s Cakes will once again be participating as a food vendor. 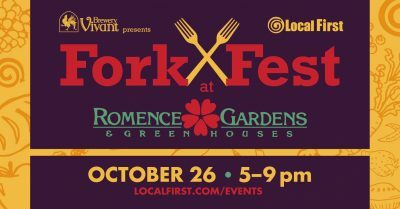 The event takes place from 5:00 to 9:00 p.m. on October 26 at Romence Gardens. Stroll from booth to booth and try samples from more than 40 of West Michigan’s finest restaurants, farms, grocers, bakeries, breweries, and more. All samples are included in the price of admission, which is only $40. Tickets can be purchased at Local First or on-line through Eventbrite. We hope to see everyone there.